is a partner in the Index to Marine and Lacustrine Geological Samples (IMLGS) database, contributing information to the IMLGS to help researchers discover geological samples curated in their facility and available for further research. Only underwater samples (dredges, trawls, and grabs) curated by the Polar Rock Repository are described in the IMLGS. As of December 2015, there are 2,776 PRR samples in the IMLGS. links back to a definitive web page for that sample at the PRR. Cite as: The Polar Rock Repository (PRR), Byrd Polar and Climate Research Center (BPCRC), Ohio State University: Geological samples available for research from the PRR. NOAA National Centers for Environmental Information. doi:10.7289/V5RF5S18 [date of access]. Open an ArcGIS interactive map interface with the BPCRR sample layer active, to search and download data from the IMLGS database and access related links. Text interface to search and download data for BPCRC Polar Rock Repository samples from the IMLGS database and access related links. How to cite this data set (doi:10.7289/V5RF5S18), all access options, and complete documentation. 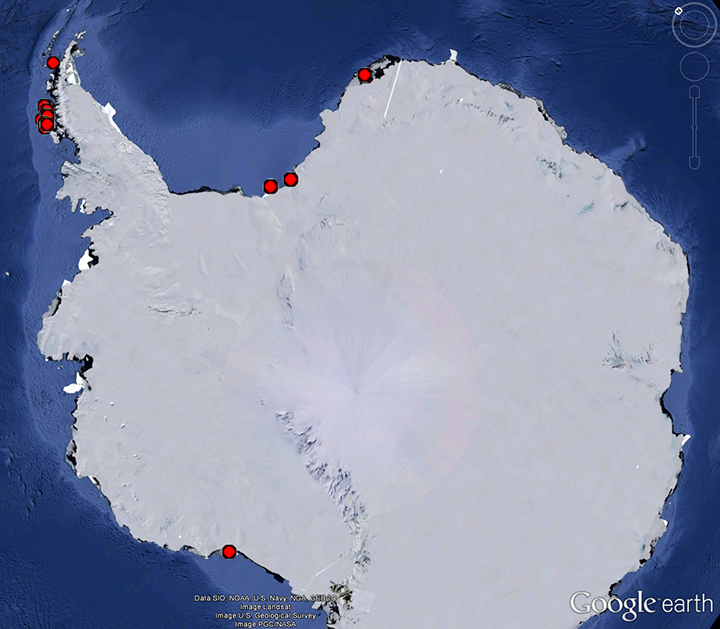 Documentation about the BPCRC Polar Rock Repository. Data Update Frequency Irregular - Sample data are contributed on an irregular basis. The Polar Rock Repository is a national facility constructed adjacent to Scott Hall, home of the Byrd Polar Research Center, The Ohio State University. It is supported by the National Science Foundation's Office of Polar Programs. The repository houses rock samples from Antarctica, the Arctic, southern South America and South Africa. The polar rock collection and database includes field notes, photos, maps, cores, powder and mineral residues, thin sections, as well as microfossil mounts, microslides and residues. Rock samples may be borrowed for research by university scientists from anywhere in the world. Samples may also be borrowed for educational or museum use in the United States. Purpose The purpose of adding information about the collection to the IMLGS is to promote new research on existing samples. Samples were collected with support from NSF-OPP. Sample data are available for free online download. Other Constraints Cite as: The Polar Rock Repository (PRR), Byrd Polar and Climate Research Center (BPCRC), Ohio State University: Geological samples available for research from the PRR. NOAA National Centers for Environmental Information. doi:10.7289/V5RF5S18 [date of access]. Lineage Statement Incoming data were checked for adherence to controlled vocabularies, illegal data types in numeric fields, and out of range latitudes/longitudes. NCEI added links to related resources, where known, and performed cursory visual inspection of data for reasonableness, asking the originator for guidance on discrepancies. Processing Environment Native Dataset Environment: database tables with auxiliary text, images, and PDF documents. Description of Source: Additional information about the samples, and research data derived from the samples are contained in the BPCRC Polar Rock Repository database which also contains links to related reports and publications.